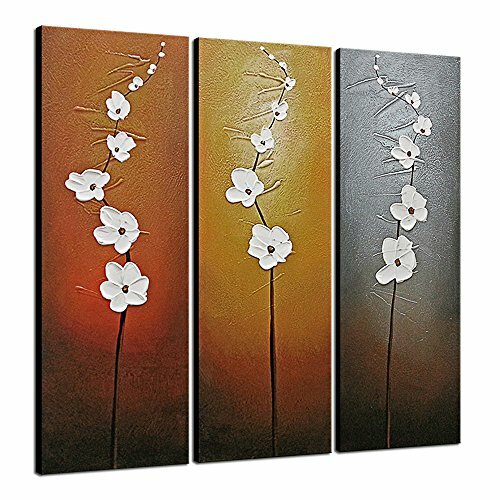 3 pcs huge size stretched and framed white flowers canvas oil paintings wall art set ready to hang for home decorations wall decor, each panel has a black hook already mounted on the wooden bar for easy hanging out of box. Make sure to buy from Wieco Art to get authentic quality canvas art. As each painting is 100% hand-painted, actual paintings may be slightly different from the product image. Due to different brand of monitors, actual wall art colors may be slightly different from the product image. A perfect choice for wall decor, home decorations and office decorations. Due to different brand of monitors, actual wall art colors may be slightly different from the product image.